"Eclipso Rising" - Part 3: "The Battle for Emerald City"
At Emerald City on the dark side of the moon, Donna Troy battles Jade, who was possessed by Eclipso at the end of last issue. Feeling low, Donna decides that "Crap City" would be a more fitting name for where she currently finds herself. At the JLA satellite headquarters, Batman expresses extreme urgency because Doomsday has kidnapped Supergirl (as seen in Superman/Batman Annual #5) and is getting away fast! Saint Walker says that despite his Blue Lantern abilities, he is currently unable to locate Supergirl or Doomsday anywhere in the whole universe. Batman is determined to help his good friend Kara, and begins to brainstorm to think of other heroes (Zatanna, Dr. Fate, Alan Scott) who might be helpful in this situation. In the middle of his brainstorming, they get an SOS from Donna, who is describing the events at Emerald City with her own sense of urgency. Batman realizes that they need to help Donna immediately. He asks Starman to contact Zatanna and get her to help track Supergirl and Doomsday. Back at Emerald City, Donna ensnares the possessed Jade in her blue lasso of persuasion and commands her to transform back into her normal self. When that fails, she reluctantly has to resort to a physical approach, and punches Jade hard. Shade intervenes and prepares to attack Donna when the "cavalry" arrives in the form of some reserve Justice League members, including Cyborg, Red Tornado, Dr. Light, Animal Man, Bulleteer, Zauriel, and others. Current member Congorilla arrives also. Eclipso sends his posse of shadow villains to engage the Justice League members in battle. As the battle ensues, Eclipso and Bruce Gordon, the inner voice of his host body, taunt each other. Eclipso possesses Red Tornado, confirming what we all know, that Red Tornado is not just a machine, but has a soul. Eclipso challenges Zauriel in hand-to-hand combat. Congorilla is on the losing end of his battle with Syththunu, the giant octopus monster. Batman, Starman, and Saint Walker arrive, and Batman and Donna fill each other in on recent events at both locations. Eclipso has already taken over most of the reserve heroes. Things look bleak; and Donna's pessimism is apparent. Congorilla mentions that the Justice League members, the ones who have not been possessed by Eclipso, are seriously outgunned. Zauriel lies vanquished at the feet of Eclipso, who brazenly challenges anyone else to take him on. Saint Walker decides to accept the challenge, and Batman, Donna, Mikaal, and Congorilla join him. The Justice League heroes battle on, but continue to feel a bit overwhelmed. Batman, Donna, Starman, Congorilla, and Saint Walker stand back-to-back, deciding they will fight together and fall together if necessary. Eclipso continues the inner dialogue with Bruce Gordon, and tells him that his ultimate goal is no less than to "kill God"! Darkness begins to engulf the JLA heroes, like quicksand. Eclipso gives the order to "take them", and we see that the person who agrees to carry out that command is Obsidian. 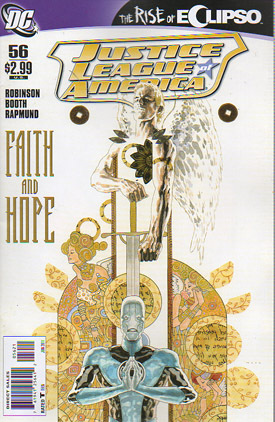 Story - 4: I continue to be impressed with Robinson's work on Justice League of America. I hope the folks at DC keep him on this title for a long time to come. I have always thought that Justice League of America must be a hard book to write, because it would be difficult to come up with threats that are severe enough to challenge such a powerful team of heroes. But Robinson has a knack for creating extreme threats that push the Justice League to their absolute limit. He tends to favor compound threats; multiple adversaries that work together or attack simultaneously to ratchet up the tension level for the JLA. In the previous story arc, JLA Omega, we had the very dangerous Crime Syndicate plus the immensely powerful Omega Man. At that time, I said that the Justice League really had its hands full; and that I had never seen the Justice League in such a tight spot! Things looked bleak! Well, I think they are a bit worse now. Eclipso is a very sinister and supremely powerful threat. In this issue, he uses his mind control to take over many of the reserve members just after they arrive at Emerald City; causing severe distress for the remaining Justice League members. Eclipso has his posse of shadow villains to keep the pressure on. And several members are still reeling from their battle with Doomsday. Although Doomsday does not actually appear in this issue, his presence is still felt, since he has kidnapped Supergirl, and her life may be in grave danger. The Justice League is in this difficult battle against Eclipso without its two most powerful members, Supergirl and Jade. If things looked "bleak" before, I might use the word "dire" here. Robinson continues to focus on characterization, especially the interrelationships of team members and the personal feelings of individual members. He has made it clear in recent stories that the bond between Batman and Supergirl is strong and getting stronger. They are very close. 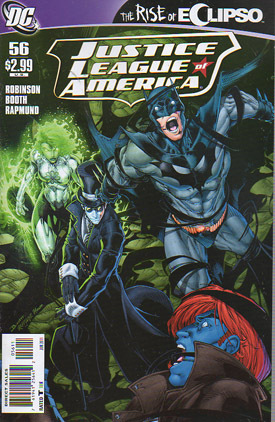 On pages two and three, reacting to her kidnapping, Batman is emphatic that the team needs to move immediately to find Kara and ensure her safety. When the SOS comes in from Donna, Batman looks really torn. He decides that they first need to support Donna; but he seems to make that decision with a certain amount of ambivalence and discomfort. At the bottom of page three, when worrying about Kara's safety, Batman almost appears to be praying. We know that Donna has been struggling recently with feelings of sadness, uncertainty, emotional fatigue, anger, and resignation. Clearly, this present crisis is making things worse. Throughout this issue, Donna seems discouraged, pessimistic, and rather fatalistic. This is evident when Batman first arrives, and she and Batman compare notes. Donna sounds as if the current crisis is almost too much for her. We see this again when Batman asks her during their battle if she is good; and Donna replies that she is just barely hanging on. If she was at the top of her game, Donna would never make that comment about "Crap City". It was interesting that Donna tried and failed to use her lasso of persuasion to command Jade to transform back to herself. The rule is that if Donna ensnares you in her blue lasso, she can force you to do what she tells you if her will is stronger than yours. So when Donna's effort failed, I wondered which of the following is the true explanation: (1) Donna failed because her will is not stronger than Jade's. (2) Donna failed because her will is not stronger than Eclipso's. (3) Donna failed because her will is just not that strong right now at all, due to her feelings of pessimism and emotional exhaustion. I was curious why Eclipso was able to possess the reserve heroes so quickly, but not the active members (except for Jade). When Eclipso tells Obsidian to "Take them," it is not immediately clear whether he wants them killed or possessed. We will see next issue. Art - 4: The Booth/Rapmund artwork seems to get better every issue. I liked the images of Donna battling the Jade zombie on pages 1 and 5, and the looks of concern on the faces of Saint Walker and Batman on page 3 as they ponder the fate of Supergirl. Cover Art - 3: Batman and Starman are ensnared in tentacles of darkness caused by the Shade. The heroes struggle and are visibly agitated or frightened. Jade stands in the background, behind the Shade. Jade is covered in green flame and looks grim and determined, as if she is about to use her powers. In my opinion, this is a pretty good cover, but not exceptional. Cover Art (Variant Edition) - 5: David Mack gives us an outstanding cover featuring Saint Walker and Zauriel in an image that is VERY intricate and suggests spirituality. The caption says, "FAITH AND HOPE". I really like this cover!